The secret of how to potty train a puppy is consistency, patience, positive reinforcement and a manageable schedule. Most puppies learn a training schedule within 4 to 6 months, and if they are under 24 weeks old, will need to potty a minimum of 3 to 5 times per day. In the beginning of potty training, be prepared for many trips outdoors throughout the day. 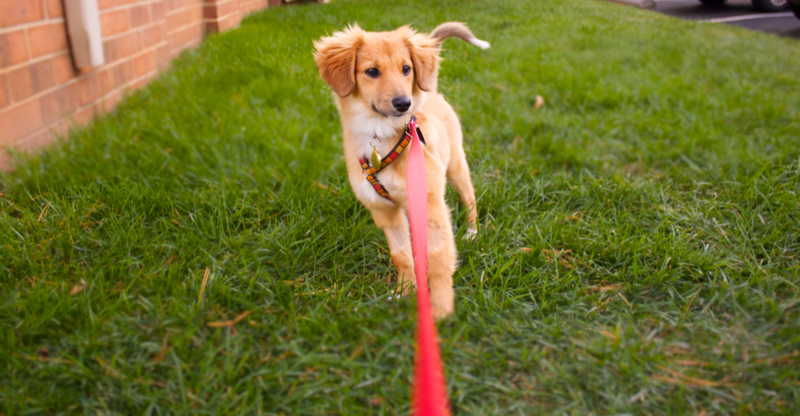 The best method to teach a puppy to go outside is consistency, and all dogs learn what’s expected fairly quickly once a routine is in place. Learn to patiently train a puppy to potty in a certain area with this easy guide. 1. Take the puppy outdoors early in the morning as possible. 2. Place your puppy in an area that he will mark as his potty-training spot. 3. Allow the pup to smell the ground and explore until a favorable spot is found. 4. After his potty, lavish your young dog with lots of praise for good behavior. 5. Return indoors to give your pup breakfast. 6. 20 minutes after eating/drinking/playing, take the pup outside again. 7. Place your puppy in the same spot he marked earlier. Allow him to explore again. 8. To help him understand it’s time to potty, walk him around the area slowly and encourage him to follow you or teach him to potty with a command that you’ll continue to use, such as “go potty”. 9. Repeat the command and point down to the area for him to go to. This may take a few tries. 10. Once the pup potties, give him lots of praise, you may even reward him with a tiny treat. 11. 2-hours later, repeat steps 7 to 10. 12. Dog training tip: be consistent, never miss a break, always be supportive to your puppy and you’ll get the results you want in no time! Which potty training schedule is best for your puppy’s age? Some puppies pick up potty training in six months but it can take longer. Puppies, like most young, learn at their own pace and it is important to be patient, kind, and supportive during potty training. A puppy’s bladder control depends on his size, breed and age. Smaller breeds need to have increased breaks as their bodies process food and liquids much faster than larger breeds. From the first day of your pup’s potty training schedule, ensure that you are consistent so that he learns that he goes out after a nap, playtime, food or any activity. Most puppies need potty breaks every couple of hours, regardless of their breed. Create a designated space for your puppy using a baby gate to limit his run of the house. Recognize your puppy’s pre-bathroom behavior; look out for potty trip indicators such as sniffing or circling. Puppies need breaks between 3 to 5 times a day or more. Take a puppy outside 20 minutes after any activity, meal and drink. Dogs under 6 months old should be on 2-hour potty rotations throughout the day. Pups learn what’s expected through consistency, take him to the same spot every time. Once a pup has pottied, give him of lots of praise to reward him for good behavior. Never punish a puppy for mistakes indoors, never yell or get physical with him. If a pup has a mishap, firmly say “no,” gently pick him up or show him where to potty. To ensure pups don’t return to the same spot inside, eliminate odors, clean thoroughly. Potty training should be a positive experience for a newly adopted puppy and can help him to feel settled into his new home. Here are some beneficial pointers to support you and your new puppy along the way. A baby gate to contain the pup in one area ensures he is always supervised and helps set him up for housetraining success. Crate training tips that let a pup feel confident and cared for, and secure. Good quality pet odor and stain remover. Dog essentials – poop bags (even at home), poop pick-ups as it can spread diseases such as Lyme in certain regions and worms. Consistency and patience are key, and combined with these tips you and your new puppy will be on the right track! Remember, occasional accidents can happen with any dog or puppy, but following these guidelines can go a long way to help set you both up for house training success! Find more information in Puppy Care 101. Get expert tips and news and subscribe to the Petfinder Newsletter.